The C&S Peanut Treat Suet Cake provides a great source of high energy to your backyard birds, which have a very high metabolism. Suet is a high-energy formulation of animal fat that is traditionally used to attract birds that do not normally come to feeders, and is an excellent substitute for insects many birds feed on that are not plentiful in cold weather. Suet is a great alternative to seed feeding and may be used to attract a wide variety of birds or a select few. Suet feeders are small enough that they may be used to establish multiple feeding zones and are often more convenient to maintain than traditional seed feeders. The C&S Peanut Treat Suet Cake is developed for year-round feeding and made with the finest ingredients. Made in the USA. 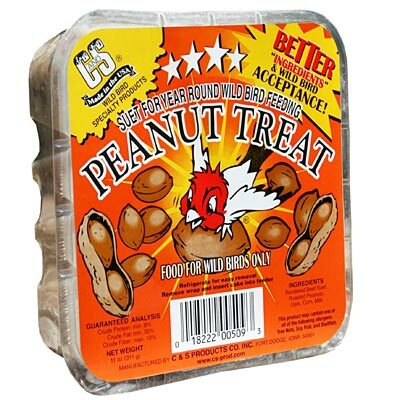 Note: This case pack includes 12 C&S Peanut Treat Suet Cakes.